Chai Latte Recipe: A Powder Mix Recipe making Daily Chai Lattes Simple! 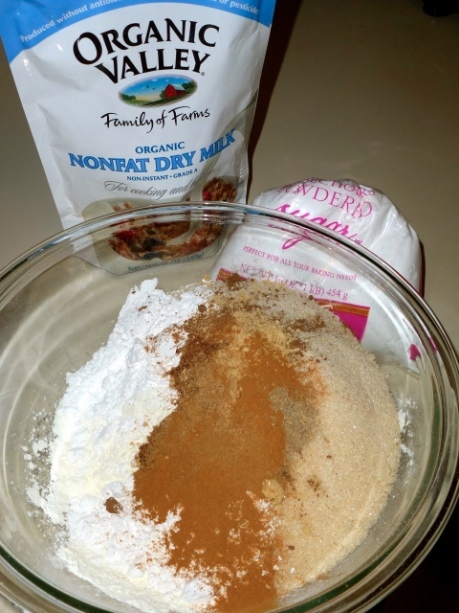 Home DIY Natural Blog Food Powder Mix Recipe for Daily Homemade Chai Lattes! Powder Mix Recipe for Daily Homemade Chai Lattes! Chai tea lattes are one of mine, and the cravings will ambush me on gray, dreary, lazy days. I’m weak against them, and often give in when the desire strikes. When I snuck into coffee shops to indulge I would always leave with a happy belly, but also calorie regrets and spending guilt. To appease my guilty mind I searched long and hard for a DIY chai latte recipe mix; one that is healthier than most, but can meet my instant (chai) gratification needs. Sadly, all the recipes I found included instant tea, powdered non-dairy creamer, and LOTS of white sugar. I’m not a big fan of instant ingredients, so I persevered to put together an (almost) instant chai latte recipe powder made with less of the bad and more of the good. 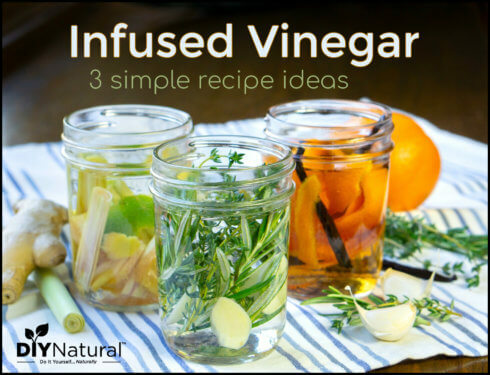 This “almost instant” recipe requires steeping a bag of tea in with each mug of the finished product. It’s not a health drink by any means, but is healthier than most and crazy tasty! 2. Measure out spices. 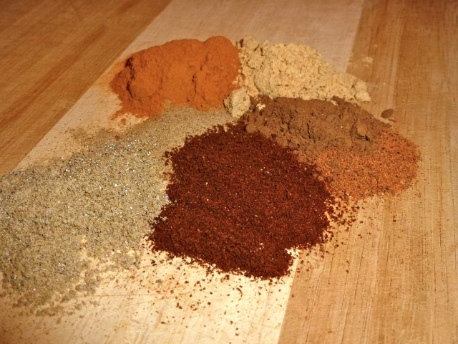 If you only have whole spices on hand, grind in a coffee grinder, food processor, or high speed blender (like a VitaMix) until they’re a fine powder. 3. 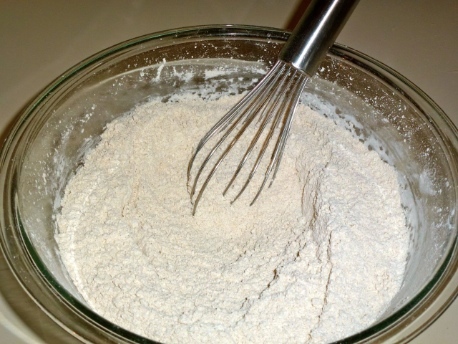 In a large bowl, combine spices, cane sugar, powdered sugar, and dry milk. 4. Stir well to combine ingredients. You’re almost ready for a hot cup of chai! 5. Stir in about 2 Tablespoons of your chai latte recipe mix to a mug of hot water, drop in a bag of organic black tea, and allow tea bag to steep for a few minutes. Slowly sip and enjoy! This recipe makes about a quart of dry mix. It fits perfectly in an quart size mason jar, and makes lovely gifts for the chai lover in your life! Tip: when giving away as gifts consider including a box of black tea and a gorgeous mug as companions to this delicious latte mix. To avoid sediment or “floaties” in your finished drink, blend the powdered mixture in a food processor or blender in 1 cup batches until it becomes a fine powder. Feel free to personalize this mix to your tastes, experimenting with different spice mixtures and different varieties of tea! If you prefer regular chai to vanilla chai, simply leave out the vanilla extract in the first step. I have NEVER been able to find a substitute for their perfection. I have been settling for whatever others made up. I like spice. The Pepper was the trick! Is there a vegan alternative to the powdered milk? The mix alone would be good, but having the instant “milk tea” would be awesome. Yes! You could use rice milk powder, coconut milk powder, potato milk powder, almond milk powder, or soy milk powder (although we never recommend soy products). Most of these are available at health food stores or online. Pay close attention to ingredients when purchasing coconut or almond milk powder though, they often contain added dairy products. Betsy, why do you not recommend soy products? Would black pepper work? I can’t ever find white pepper. No, black pepper will give it an off flavor but you can try it with no pepper, it’s still wonderful. I’ve been making it without the cardamom or pepper because I couldn’t find either. Well I just found the cardomom & wanted to try it the way the recipe states but couldn’t find white pepper. I’ll keep looking. Powdered sugar? do you mean confectioners sugar which has corn starch in it? or the fine ground sugar used for cold drinks? Sorry…yes, confectioners sugar. 🙂 You’ll want to purchase organic since it could likely contain GMO corn starch or sugar from GMO sugar beets. Stevia users: how much stevia powder would you suggest for the recipe? I have pure stevia powder, not the stuff in packets that they try to pass off as stevia. ARGHHH! I was recently introduced to Chai and became addicted! The instant chai was becoming an expensive habit so I thought I’d try and make it! I basically made the recipe, using just the spices and half the sugar. Then, I add hot water to a teabag as you would making a cuppa, milk (soy or cow’s), and 2-3 teaspoons of the spice/sugar mix. Can be a little bit grainy but I let it sit for a few minutes to settle and cool down, then skip the last mouthful haha. Works beautifully!! Next time I think I’ll skip the sugar and use vanilla powder if I can get a hold of it, and my usual stevia. Thank you so so much! This will be an awesome addition to my annual Christmas gift baskets of homemade goodies! Thank you for the recipe….the mix smells heavenly, just waiting for the kettle to whistle and I will be able to taste it! I have the chai each morning — it’s instead of coffee for me. So, I need to make a new batch every week or so. I have sped up the recipe by not putting vanilla in the recipe (the drying of the sugar takes a while and is an extra chore for me) and so I add a bit of liquid vanilla to the cup I make in the morning. I also don’t do the food-processor. It does make the cup a tiny bit grainy, but it saves a lot of time when I make the batch. This way, I can even make the chai mix the morning that I run out, even if it’s right before work. So good! My kids love it too! I made it with earl grey and it was excellent! Thank you so much for this natural chai!! I try to make most food all natural and healthy so this was perfect..yummy, quick, and not too expensive! Nice treat for us all..especially on these fall days! Found this recipe yesterday and tried it today, great result – tastes really good! Thanks very much. I’ve read a lot of people that suggest steeping store bought Chai bags in milk instead of water. I’m willing to bet this would work similarly. Make the mix as directed but without the milk & add to a hot cup of milk & steep your tea in that. Not positive of the order. Some people say to add the tea bags to cold milk on the stove & warm, others say to add the bags to the already hot milk. They all say warming on the stove is best, though. I’m no expert and haven’t tried it at all, just thinking about what you had asked. I would love to know if you try this. You might have to play with the amount of mix you use in each cup to get the ratio right. Best of luck! I just stumbled onto this site, and it’s wonderful. I was especially excited to see this particular recipe because I’d tried a chai mix of my own for the exact same reasons, but the only one I found was more of a concentrate than a powder. I’m excited to use this and have it last longer! LOVE your chai tea! Because of a digestive issue, I have needed to quit coffee. And I love my coffee! Something I read said that chai might make it easier to quit. Well, I did, and chai did help me. I have made my second batch today. I made a few changes — Less milk and replace the milk that is missing with coffee creamer; no nutmeg (too grainy); more ginger and cloves and cinnamon and pepper (I think you can tell I love spices!) I get to try my new batch tomorrow! Mmmmm….enjoy your new batch, sounds tasty! Yes, I was very pleased to be able to use decaf and my own sweetener too (I used xylitol in the last batch, going to try stevia in the next batch – time to make some more today!). Just don’t store it in the same cupboard and in the same style jar as psyllium husks – apparently it looks very similar to ‘some people’, who will then make you the most disgusting cup of tea you’ve ever had! I am an AVID Chai drinker. I have a cup every morning when I can. It is my one guilty pleasure. 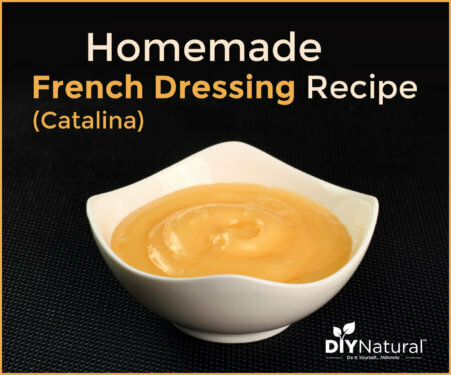 I have been wanting to find a homemade recipe not only for the cost benefits but for the ingredient control. We are going to start trying to get pregnant soon & the idea of having to give up the Chai for the sugar & caffeine was making me very sad. Now I can control the sugars & use decaf tea!!! So excited to give this a try! I brew double strength chai tea from a bulk tea. It is pre-seasoned with spices. Store in fridge and add soy, milk. I drink them cold and hot. There is no sugar, which I prefer. You can use plain black tea, add spices and then brew. I have done both. The second method allows me to use more ginger and pepper. This can also be done with green tea. There’s only one problem Betsy – it’s addictive! I had to have another cuppa (in the interest of science of course) and one tablespoon was nice but not as gorgeous as the first cup. Works well with 1 1/2 tablespoons though. The fact that mine has xylitol in it will stop me from having it too often, though, or I’ll get undesired side effects, lol! I had to go to the shop to buy powdered milk but I had everything else in stock (I used xylitol instead of cane sugar though). I was too scared to put in the pepper but I love it as it is. I would occasionally make my own masala chai from scratch but I would say this tastes just as good. I have also used the ‘instant’ stuff from the shop but it was a rare treat as it’s so expensive. One of the things I love about this is I can use the sort of sweetener I want and the sort of tea I want too (I used a full flavour decaf today). I’ve not gone plastics free (though you’ve put the idea in my head now!) and I had a plastic jar that was heading for the landfill (not recycled in our area) so I rescued that and it’s perfect! I did blend mine so I’ll try it with one tablespoon as Tracy suggested and see if it still hits the spot (no gel in mine, just the sediment at the bottom – will swirl in future!). I’m tickled that you’re so pumped about this recipe Norm! It makes my day! 🙂 I’m glad you tweaked it so it was more to your liking…we always encourage that! Norm — I really like the pepper! You ought to try it with just one cup; make a cup, and sprinkle a little pepper in, to see if you like it. Then, you could pepper up the whole batch if you want to! Thanks for the recipe. Not being a fan of white sugar, I left out the granulated sugar (I did leave in the powdered sugar, for creaminess). I stir in a spoonful of honey once the tea is steeped. 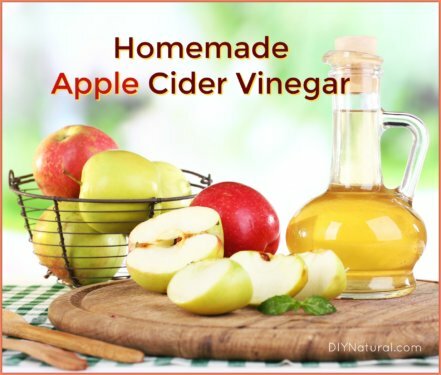 You could also use Stevia or another sweetener of your choice. I pulverized everything in the blender to make a fine powder that dissolves instantly — this also helps keep the spices from sinking to the bottom. It worked great! 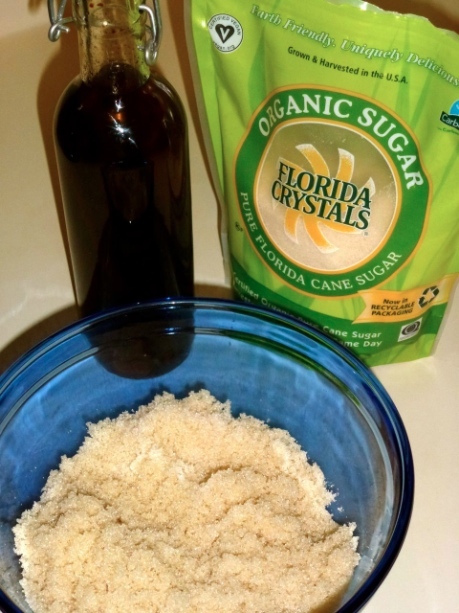 We don’t use white sugar either…organic cane sugar for this recipe, but definitely use the sweetener of your choice. Honey sounds great! For cheap carmadon try the middleastern or indian food store. Ethnic ingredients are always cheaper at the appropriate ethnic grocery store. Yes! This is where we got some whole cardamom a while back and I just ground it myself in our Vitamix! Thanks for reminding me about this Mary! 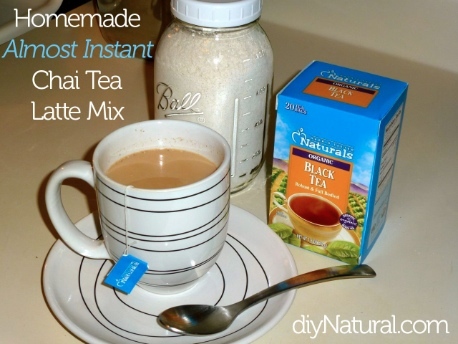 I wasn’t necessarily looking for an “instant” mix, just a more efficient way of making chai. Measuring out the spices every time means I don’t make chai nearly as often as I’d like. So I took the suggestion of one of the folks above and left out the powdered milk and will use fresh raw milk each time we make it instead of the powdered milk. I also threw everything in the food processor instead of mixing by hand. Since this makes the blend so fine, I used one tablespoon per cup of tea instead of two. It worked very nicely! My children love it too. I think this will make it to our Christmas gift giving list this year! Thanks, Betsy! BTW it fit nicely in a quart mason jar. Wonderful Tracy! Glad you’re getting your chai fix in a more efficient way now! How did you know I was craving this? Where I live overseas, you can’t find this. I was just about to look up a recipe and . . . voila! There it was in my mailbox. Thank you so much! I’m making this today! I hope you love it Marcia! I knew there had to be some fellow chai fans out there craving it just as much as I was. 🙂 Enjoy! I adore Oregon Chai – but it is expensive to keep around. Thank you for the recipe, Betsy! I follow “Nourishing Traditions” by Sally Fallon. Higher protein and good fats and lower carbs. Nothing processed, raw whole milk, and lots of fresh grass fed raised meat, butter, coconut oil, fresh pastured eggs, and lots of veggies. My health this last year since I started this Traditional eating has taken a 360 degree turn for the better. I have lost 60 lbs and am so healthy. It does go against the norm for eating (as in low fat) and it is hard to belive but is so much better for your body! Check it out. We eat very similar and are very healthy. I’ve never heard it termed “Traditional” but that makes sense. Whole foods are always best, local whenever possible. I am with you. I am a Chai freak!! I would buy the instant because it was cheaper since I would have 2 or 3 cups a day. Since I have started eating a Traditional diet I am on the lookout for a chai that fits. It is very hard to make instant. I like your recipe though I would make a couple of changes. Instead of using the powdered milk just add cream or milk to your cup when you are steeping the tea with your spices. Although not quite instant, but if you are eating a Traditional diet the word instant is nonexistent! Also, did you find that your spices gel up in the bottom of your cup? When I was making my own instant mine would gel up.